So you can’t have a lightsaber in real life because a) they don’t exist, b) you might hurt someone – but neither reality nor the police can stop you owning the lightsaber duel app for iPhone. 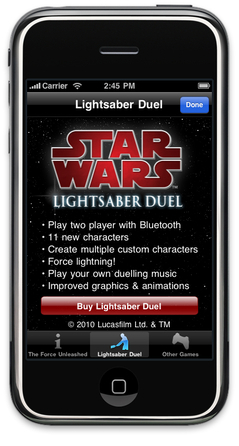 An exciting update to the previous lightsaber app for iPhone, this one lets you fight your friend in a lightsaber duel. With special effect noises. It uses bluetooth to work out where your “blade” is. Out on iTunes soon – for the Star Wars nut in your life.